• No smoking is allowed in guest rooms. Smoking is only allowed on the balconies of some of the rooms. • No smoking is allowed in guest rooms. Kindly note that the minibar in the room can be filled upon request. Should you wish you can prebook your Minibar Package from our various options. 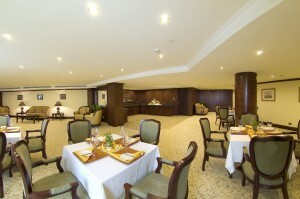 Executive Lounge (located on the 8th floor) open from 07.00hrs till 20.00hrs. CHECK IN – CHECK OUT The check-in time is at 15.00hrs and check-out time is at 12.00 noon. MEANS OF PAYMENTS All major credit cards are accepted for payment: Visa, American Express and MasterCard. CURRENCY EXCHANGE Most foreign currencies can be exchanged to Euro at Reception or in local banks. PRE AUTHORISATION The hotel reserves the right to pre-authorise credit cards prior to arrival. At check-in, the hotel reserves the right to preauthorize a security deposit on your credit card, over and above the price of your stay. The deposit is 50 EUR per night to a maximum of 150 EUR of your booked stay.